For great part of my life my morning ritual was: snoozing the alarm multiple times, throwing myself out of bed, brushings teeth, washing face, clothes on and a run to the bus stop! No breakfast and luckily I always shower before bed. As I grew up I started to introduce little things, trying to wake up a few minutes earlier. Always a shock! First additions to my super quick, ‘get ready and go’ routine, were the ayurvedic practices of cleaning the tongue and washing the nose. What, really?!? YES! Having a mum who teaches Ayurveda to her yoga students in teacher training, I came across the use of these two tools way before I studied Ayurveda on my training. As weird as it might sound, I begun looking forward to cleaning my tongue and washing my nose. Soon I started to take them with me whenever I was travelling too. The tongue scraper is used in the morning on an empty stomach (I use it after brushing my teeth) to remove toxins, called ama in Ayurveda. Ama naturally surfaces on the tongue over night and if not removed, will be ingested back into the system. Using a tongue scraper not only makes your mouth feel cleaner, your breath fresher and enhances your sense of taste, it also ensures toxins and bacteria are removed. Next is the neti pot, a small container filled with warm water and sea salt for nasal irrigation. The content poured into one nostril, exits from the other one, cleansing the passage. It removes excess mucus, dust, dirt, pollen… anything that shouldn’t be there. It enhances sense of smell and taste and can be very helpful for those suffering from problems of the upper respiratory tract. On normal days it makes my nose feel clean and when I have a cold, it helps getting rid of it faster and breathing better. Soon after this, I added warm water with lemon to my routine. This acts like an internal shower for the system when ingested on an empty stomach. I now add a spoon of apple cider vinegar to it to kick start the digestive system. Years later, on my yoga teacher training I became familiar with another technique used by yogis to purify from toxins: nauli kriya. This consists in the churning of the belly to massage internal organs and stimulate the natural elimination process. It requires strength, abdominal tone and focus to do and it’s best learnt in person, with a teacher. Practicing nauli kriya can increase mental clarity, boost metabolism and strengthen the immune system. It’s best practiced on an empty stomach in the morning. 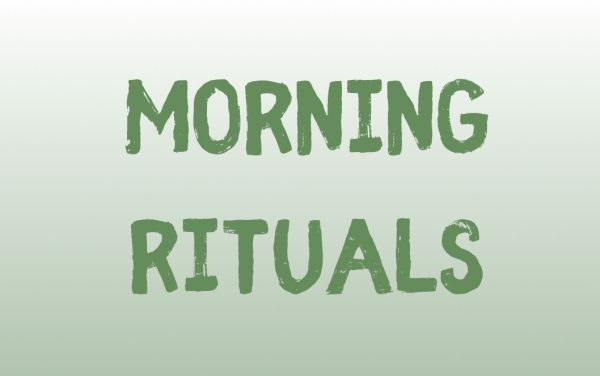 If you’re curious to see what it looks like, watch my morning ritual video. For the past couple of years I have closed my morning ritual with meditative time. This starts by reading my favorite daily meditation book (“Journey to the heart” by M. Beattie), which offers a short meditation for each day of the year. I then sit quietly and close my eyes for 5 to 15 minutes, depending on how much time I have. I mostly meditate on my own and just set a timer using the Insight Timer App (free on your app store). Sometimes I do guided meditations using the same app. There are some morning meditations which last less than 10 minutes and can be a wonderful guide. So overtime I built this morning routine which now doesn’t take me longer than 20/30 minutes. I usually have a smoothie after this and get ready to go to work. I am not a morning person, but having this routine has helped me to want to wake up with enough time to do all of this. It makes me feel fresh and energized and I look forward to it now. And as you can see, there is no asana practice in my morning routine. I much rather practice later in the day. Now that I teach full time, I don’t have a set time for my daily yoga. In my previous life in the corporate world, my favourite time for yoga was after work. These moments of self-care are essential to be able to be the best version of ourselves, for the benefit of everyone around us. If you’d like to start your own morning routine, I suggest to start with something simple and once that becomes a habit, add more on. Your routine should make you feel good, and give you a sense that you’re caring for your wellbeing. There is a website that offers suggestions on what to include in your routine, based on your body type. Start by finding out your dosha (this is your body type) and get guidance on a routine that would suit your needs. “A daily routine invites health, vitality, and a sense of clarity into our lives. Adopting an appropriate daily routine is undoubtedly one of the most grounding and nurturing things you could do for yourself, and while the concept of having a daily routine is at the heart of an Ayurvedic lifestyle, no single prescription is right for everyone” say experts at banyanbotanicals.com. I hope you find what’s best for you and it helps you to feel good in your body and mind.